As an FDA member, we make sure that you keep abreast of all the latest news and developments relevant to you through our regular member communications. Public Service Magazine is the FDA's award-winning glossy magazine. 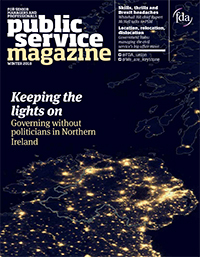 More than just a members’ journal, it is also a widely-trusted public sector magazine containing news and features written specifically for senior managers and professionals in public service. The magazine is published quarterly and sent to all FDA members and subscribers, including journalists and members of Parliament. All members receive regular FDA newsletters straight to their inbox, with information about the latest FDA news and activities including details on how to get involved in your union. Bespoke updates are also sent out at a departmental level, to give you the latest FDA news and updates specific to your workplace. As a member, you also get exclusive access to detailed briefings and guides, accessible through our members’ area, to ensure that you are fully informed before making any decisions that will affect your working life and future planning. These range from in-depth analysis of changes to the Civil Service Compensation Scheme to easy-to-understand explanations of civil service pension schemes and advice on workplace health and safety. Another way to keep up-to-date with the latest FDA news is to follow us on Twitter. The union tweets from @FDA_Union, and General Secretary Dave Penman can be found on @FDAGenSec.